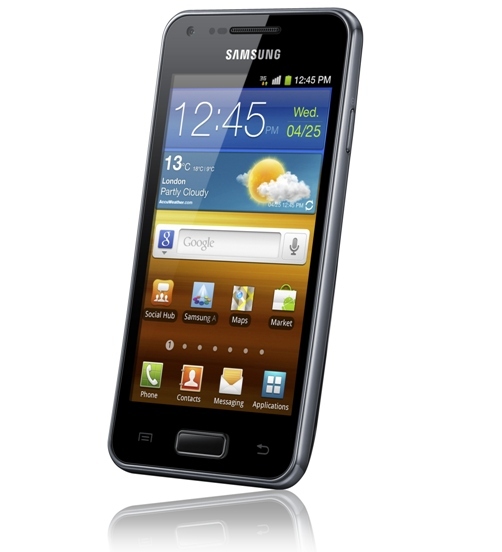 Samsung has officially announced the Samsung Galaxy S Advance smartphone powered by Android 2.3 OS. The phone has 1GHz dual-core processor and and 4-inch WVGA Super AMOLED display with curved glass design. The phone comes with 5 Megapixel rear camera with LED Flash, 1.3 Megapixel front facing camera,720p video playback and recording and it runs on Android 2.3 OS with Touchwiz UI. The Samsung Galaxy S Advance also features ChatON service provides instant-messaging, group chatting and sharing of content in multiple formats like images, videos, voice, contacts and calendar. Find My Mobile, a unique lost-phone management systems enables users to trace their lost phone directly via the web or even delete the device data remotely. Samsung Galaxy S Advance would be available in Russia starting February, followed by CIS, Europe, Africa, Middle East, Southeast and Southwest Asia, Latin America and China.